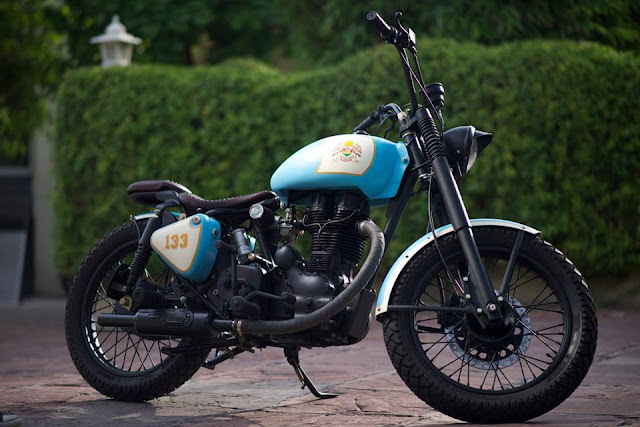 Known as extraordinary compared to other custom bike developer of the nation, Rajputana Customs has been conveying the best of workmanship on motorcycles as far back as they were in real life, began in 2009! With the expanding fan following in Indian and universal bike aficionados, Vijay and his group did their hands on different stage like Harley Davidson, Triumph and not to overlook what they did the most, with Royal Enfield motor ~ both on old and new motors. Look at the most recent Royal Enfield with 350cc Cast Iron motor, with minor customization what they did is to a great degree well blent of paint plot. Bike has given a bule color over which white color gives the retro look. Lifted Speedometer adds like a feather in the bikes hat. This bike is called Retro 350 as the bike used is RE 350. Rajputana Customs will take 1 month time for this modification job. Customer has to give his RE 350 or 500. This modification will cost Rs. 1.5 lakh.